The Charlottesville Derby Dames have their first real home bout (i.e. 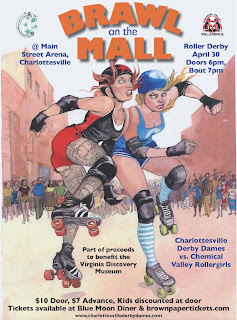 in Charlottesville) on April 30 at the Main Street Arena downtown. $7 in advance, $10 at the door, bout starts at 7pm, and proceeds go to the VA Discovery Museum. You will have no idea what is going on. That doesn't matter because a bunch of girls on roller skates will be trying to knock each other on their asses, and they're serious about it. What better way to settle down after a day of looking pretty and binge drinking in the sun? Have I mentioned you can get beer at the skating rink now? That's nice. To get warmed up, this Friday at 7pm the Dames are having an intraleague scrimmage that's open to the public, also at the Main Street Arena. Check it out between Fridays After Five and roaming the downtown mall for the first time in 6 months.